Superior third floor corner unit with terra cotta tile floors, Bali teak furniture, Gourmet kitchen. Queen bed, washer/dryer, free WIFI! Recently painted and nicely updated! A guest from North Vancouver, BC United States recommends this vacation rental. Another wonderful stay at #315 at the incomparable Kaleialoha, thanks to Lonnie, who is always a pleasure to communicate with and answers any and all questions in a timely manner, and makes sure you have a wonderful stay. The unit & property itself is wonderful - perfect waterfront location. Turtles, surfers, sunsets, close to a great farmers market, and Whalers village. Not our 1st stay and definitely not our last. Highly recommended. Mahalo Cindy! So glad you enjoyed and see you again soon! A guest from Port Orchard, Washington United States recommends this vacation rental. Wonderful location. Well equipped kitchen and very clean condo. Will recommend to friends and family. Janeen C. from Herriman, UT United States recommends this vacation rental. Congratulations and hope to see you again soon! The bed actually has a new mattress topper! Thanks for the review! Ed E. from Kent, WA United States recommends this vacation rental. This was our third stay at Kaleialoha and we're already planning our fourth. We've stayed in three different units and all three have been exceptionally appointed, clean and very comfortable. The views are spectacular any time of day or night (we especially miss the sound of the surf at night). The location can't be beat, sort walsk or drives to any and all services and markets we need. Kaleialoha property management have been very responsive and helpful when needed. All in all we enjoy Kalealoha more each time we visit and look forward to doing it again. Mahalo and look forward to seeing you again soon! John S. from Wolfeboro, New Hampshire United States recommends this vacation rental. Staying in Kaleialoha #315 was awesome! We enjoyed spending hours on our lanai watching the sea life. The condo was well appointed and centrally located for exploring the Lahaina area. This was our second time staying at Kaleialoha and we will surely be back! Tricia G. from Lahaina, HI United States recommends this vacation rental. This was our first trip to Hawaii and because we had such a great experience in unit 315, we will be back! One of the many nice touches was when we first entered the unit and could hear the sound of waves crashing through the open lanai doors. It put a smile on our face right from the beginning. Lonnie was very responsive to all communications and was very helpful as well as accommodating. Mahalo and Aloha until next time!!!! Karen D. from Lahaina, HI United States recommends this vacation rental. First is the view. As soon as you walk through the unit you catch the amazing view. Corner unit so only one shared wall in the living room. Amazing breeze blows through constantly. It was an amazing stay and I will be back! Mahalo! Come back again and ask for our repeat guest discount! michelle m. from San Jose, CA United States recommends this vacation rental. I stayed in 315 at Kaleialoha. I really enjoyed my stay. The view was absolutely amazing. The condo was clean with all of the supplies that I needed for my trip. All communication with Lonnie was great! She responded promptly to all requests. I will definitely stay In 315 again. It it’s a corner unit so there was always a cross breeze in the unit. A guest from Lahaina, Hawaii United States not recommends this vacation rental. Lani went above all expectations to satisfy our concerns, including early and late check in and check out, new cookware and assistance with the t.v. and bed. Overall a great vacation. Grill area was clean and nicely maintained. Aloha Paul! Glad I could help! But the review says "recommended to others" and you said no? Just an oversight on your part I am assuming! Unless you wanted to keep the property a secret! See you next time! Kristl B. from Lahaina, HI United States recommends this vacation rental. If you are looking to avoid large crowds and soak in all that Maui has to offer, this is a wonderful place to stay. Down the road is a lovely market with fresh food and every morning I would grab a coffee from "Bad ***" Coffee Company. I personally try to avoid the larger resorts to a more laid back, quiet vacation. There is plenty to do and places close by when you do want to be in the center of Kaanapali Beach area. I hope to return one day. And Yes, I would stay here again for sure. Kimberly K. from Lahaina, HI United States recommends this vacation rental. Amazing views and amazing location. Unit was super clean and exceeded our expectations. John M. from San Marcos, CA United States recommends this vacation rental. Perfect vacation. Lanai with a view that I could look out on forever. Mahalo and so glad you enjoyed! A guest from Pacifica, CA United States recommends this vacation rental. An extra clean room with a great view of Lanai and Molokai! Many extras in the room made an easy happy safe stay at the Kaleialoha. Gorgeous sunsets from the balcony! Kim G. from Casselberry, FL United States recommends this vacation rental. The location can't be beat. We were able to watch whales from our balcony and swim with sea turtles within view of our room. Cindy S. from N. Vancouver, BC Canada recommends this vacation rental. Beautiful view, great accommodations, helpful and friendly staff. All you could ask for in a Maui rental, and a great deal all around. Will be back! Beau P. from Midvale, UT United States recommends this vacation rental. This was our first time to Maui and we absolutely loved it! We loved having the corner unit because you get the breeze throughout the entire condo. The view was so beautiful from our lanai and we loved being able to watch the sea turtles and birds. It was so nice to be able to have a kitchen and prepare our own food to save on expenses. This was such an amazing experience! Jack C. from Boucherville, Quebec Canada recommends this vacation rental. this property was really beautiful and would come in a flash. Thank-you for ending my vacation on such a positive note. Sue F. from Santa Fe, NM United States recommends this vacation rental. Kaleialoha #315 was the perfect place to stay for 10 days. We had outstanding sunsets in the evening and woke up to rainbows over the ocean in the morning. Loved watching the turtles go back-and-forth from our lanai. What more could you ask for. Our unit was very nice and had everything we needed. I would definitely come back again. Jill T. from Los Gatos, Ca United States recommends this vacation rental. We had an amazing time at Kaleialoha, staying right on the water in front of a reef with its own sea turtles. The condo was perfectly outfitted with everything we needed from linens and kitchen equipment down to snorkels and beach chairs. Sunset was a show every night with views of Molokai and Lanai and outrigger canoes and surfers. The location is fantastic since its close to Kaanapali and Lahaina with locale favorite spots like the Farmer's market, Fish Market, Black Rock and more all in walking distance. Very romantic for couples and fun with lots to do for families with kids. 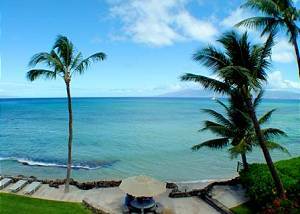 Mai S. from Lahaina, HI United States recommends this vacation rental. it was an amazing apartment, fully equipped with everything you would need. The view from the balcony is breath taking, I can’t forget the way we felt when I took these couples of steps and saw the view!!! Was totally amazed by this beautiful place. Got very excited when seeing sea turtles swimming around on the balcony. Quiet and convenient. Patricia & Richard C. from Los Altos, CA United States recommends this vacation rental. This was our fifth time at Kaleialoha. We will be back. Lonnie is a real asset. So pleasant and helpful to guests. Garry & Karen P. from HANNA, IN United States recommends this vacation rental. This was our 8th stay w/ Kaleiahola and our first week was in Unit 315 was great! Our second week was in Unit 205 and we were disappointed. The bathroom looks like it has not been touched in years. The exhaust fan is unsafe, the shower/tub has been over chaulked to stop any leaks and looks twenty five years out. Very weak for a rental unit in Maui! We felt it was more like a "CHEAP" Motel 6 than a rental condo. #315 to #205.....not even close. We look forward to returning for another stay but will check out the unit more carefully bsfore our next time. James & Linda S. from Cashmere, WA United States recommends this vacation rental. Great place to relax and enjoy the ocean. We love the property. We only wish we could figure out how to use the internet with our Ipad, ha. Had to go to Starbucks in the morning to check email. Oh well, gave us a chance to get a coffee. Roman O. from Wood Ridge, NJ United States recommends this vacation rental. The condo has a great view, very nice property managers, and is pretty conveniently located if you want to see West Maui! I would definitely recommend staying there. The unit was extremely clean and even the pull out sofa provided a great night's sleep with the noise of the ocean in the background. An ideal location on Maui! Cindy G. from Aberdeen, WA United States recommends this vacation rental. This was our second year at Kaleialoha, staying in room 315. This condo is as close as you can get to the ocean, with the most incredible views of Lanai and Molokai. Sitting on our lanai we watched turtles, surfers, sailboats, snorkelers, and outriggers on a daily basis. And, although not a new facility, the Kaleialoha is immaculate and the surrounding grounds were very well kept. We are definitely recommending this place to any of our friends planning a trip to Maui. James & Madonna S. from West Seneca, NY United States recommends this vacation rental. no surprises great place to stay. A guest from Auburn, CA United States recommends this vacation rental. A guest from Bellevue, WA United States recommends this vacation rental. we stayed at the kaleialoha #315 and the view was just fabulous! we were in waikiki for about a week before this and all we did was run around with our family, so we were very much looking forward to our 5 days of relaxation! We arrived about 6pm and the office was closed but found our key at the manager's room. When we got inside our room we were greeted with a nice box of chocolate covered macadamia nuts :) very nice surprise. The room was nice and clean and had everything we needed. there were beach towels to use and a laundry in the unit. Super convenient since we really needed to do our laundry! The kitchen had everything we needed, well except a chip clip :) did I already say that this unit comes with an amazing view?! You could see 2 islands from the lanai! One afternoon we even saw a sea turtle swimming by :) definitely cool :) My one complaint about this place is that it doesn't have much of the beachy/sandy area if I were to bring my son next time, but if you just want to swim well the ocean is literally just steps away :) There is a grill area too, not that we used it but other people did and their food smelled really yummy! Not much around this place as far as restaurants and shopping though. We ended up going to Lahaina and the Kaanapali resort area for shopping and food. To sum it up, great unit with a great view for a good price. We ended up getting a rental car so having to drive a bit for food wasn't a big deal. Definitely check this unit out if you want a nice quiet place to stay! Amanda B. from Abbotsford, BC Canada recommends this vacation rental. A wonderful place to enjoy a get away from everyday life :) Each morning we would enjoy a cup of coffee and breakfast on the porch overlooking the ocean watching the turtles come up and eat off the rocks. Very clean accomodations with virtually everything you need to have a stress-free holiday. The management was friendly and helpful. We would most certainly recommend and become repeat vacationers at this property. Jerry K. from Bulverde, TX United States recommends this vacation rental. This is the first time we stayed in 315 and it was a pleasant surprise. Being a end condo the outside wall was comprised of windows which could be openned to allow the cool breeze to blow in. The condo was well equiped and was very comfortable.The management staff was very nice and helpful. Patricia C. from Alameda, CA United States recommends this vacation rental. We love our unit and feel like we are coming home every time we visit. Lonnie is always helpful. The only downside is the cigar-smoking neighbor who arrives around May 20. It would be the only reason to hesitate returning for a 7th visit. Bryan & Susan G. from Delta, BC Canada recommends this vacation rental. ~ Sorry I'm a little late with this review !! #315 was fabulous ~ everything we thought it would be, great location, wonderful to sit with our coffee in the morning and watch the turtles feed right on our beach. Quiet, great location, clean and very well appointed. Thank you ~ have already recommended to many friends who are heading to Maui !! A guest from Grover Beach, CA United States recommends this vacation rental. We had a fantastic stay at this rental. It is in a perfect location with the ocean right off our lanai. The property is immaculate. The groundskeeper was working constantly to maintain everything in tiptop shape. I tell anyone that asks to check out the Kaleialoha--they won't be disappointed! Kyran C. from Aurora, OR United States recommends this vacation rental. Been staying at the Kaleialoha for decades now and always enjoy it immensely. Clean, bright, convenient and very comfy. Unit #315 is superb as it has an amazing view, has everything needed (washer / dryer / dishwasher / kitchen items necessary for cooking, beach towels, TV, videos, etc.). Being on the corner unit is great because you get windows and lovely light and sounds of ocean. Location is fantastic as you can walk or bus or drive to Kaanapali and Naplili etc. Quiet and safe, with a nice, clean pool. Staff are very helpful and have always been a great. From time to time I look for a better place but so far haven't found it. Five stars, for sure! Looking forward to next visit already. Cheryl C. from Eugene, Oregon United States recommends this vacation rental. My 2nd stay in January at this wonderful property. The weather did not cooperate but did not keep us from a relaxing and enjoyable vacation. At least the temp was warmer than the constant 39 degrees of Eugene. I hope to return again and would most definitely stay at the Kaleialoha in Honokowai area. Jay A. from San Diego, CA United States recommends this vacation rental. We had a good time and will definitely come back. Recommended and a must if you want to have a quiet intimate time with the beach just right in front of you when you wake up! Sebastien H. from Pau, Bearn France recommends this vacation rental. The view was awesome, the appartment was more than we expected, everything was just great! The first lady who checked us in was really wonderfull, very sweet. The second lady, who we saw days after was a little like cold, like she didn't have the time. But in all the stay was wonderfull! We keep coming back year after year because this is a very special place for us. Laura R. from Woodinville, WA United States recommends this vacation rental. We couldn't have been happier with staying at this older condo that's been immaculately maintained. It was a great place for the kind of vacation we were looking for....a balanced blend of relaxing and reading, as well as, spending time out and about on the island. Our unit was nicely decorated in an Hawaiin theme and very well stocked. The view was awesome and we enjoyed time every day on the good size lanai. My only caution would be, that while this condo can technically accommodate 4 guests if you use the sofa bed couch, I think it would be rather cramped for 4 people. Perfectly comfortable size for two! A guest from Calgary, AB Canada recommends this vacation rental. A guest from Prince George, BC Canada recommends this vacation rental. Robert & Susan K. from Castle Rock, CO United States recommends this vacation rental. This is our third visit to this property and second time we rented 315. Loni is always terrific. The unit could use a little maintenance...drawer in kitchen coming apart. A guest from Montreal, QUebec Canada recommends this vacation rental. From the moment we booked the property until the moment we left, everything went without a synch. The property had everything we needed and more and was TRULY oceanfront. It is in a great location and you can go down the stairs and swim in the turquoise water. If you want to swim at Kaanapali Beach, you are only about an 8 minute drive! Only about 2 minutes away from the ABC store and other restaurants. Truly a Gem. Hoping to be back there soon!!! A guest from Okotoks, Alberta Canada recommends this vacation rental. The stay in unit 315 was wonderful. To be steps away from the ocean where you see turtles, eels and whales is an experience like no other. JOE C. from United States recommends this vacation rental. We had the time of our lives!!! From the staff to the detail of the property it was Great!!! We saw Humpback Whales, SeaTurtles, and all types of Sea Life from our Lanai and from the chairs at the Oceans side. We Highly Recommend this property if you want a trouble free and Fun Vacation, Joe & Tracy!! !